You can schedule an evening service call that fits your schedule, without costly overtime charges. Our regular business hours are 8:00am – 8:00 pm, Monday through Friday. Major credit cards are accepted for all McAfee services. Our team of professionals will be on their way to your home whenever you need a repair: 24 hours a day, 7 days a week, 365 days a year. With our reasonable On Demand repair rate, you can count on McAfee for the repair of your furnace or air conditioner. Major credit cards are accepted for all McAfee services. Save money on repairs and maintenance of your HVAC and air quality systems. Comfort Family offers special discounts, priority service, and more. 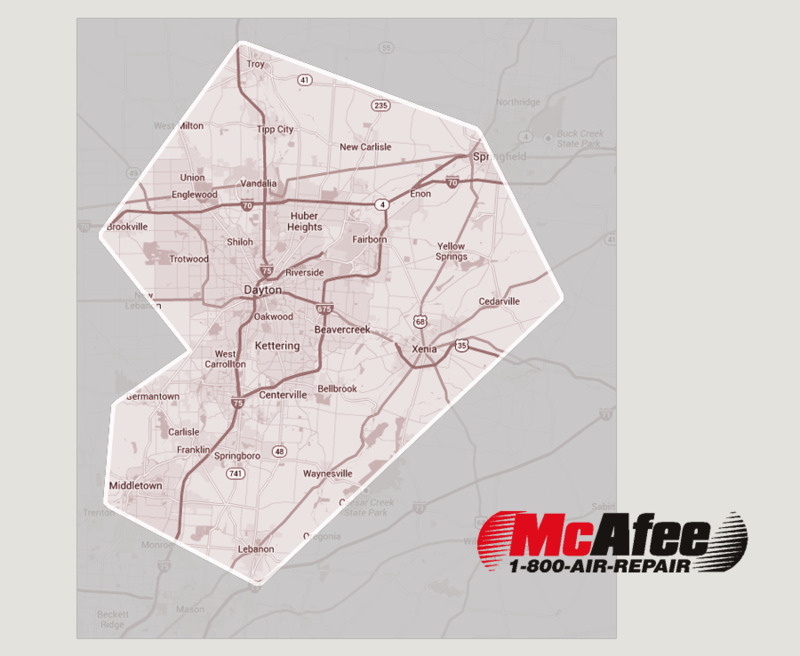 McAfee Heating and Air Conditioning is a locally owned, Dayton, Ohio area company. Find out if your home is within our service area using your home’s zip code. We service your area! Call (937) 438-1976 or fill out our contact form, and we’ll call you! Sorry, we do not currently service your area. View our current specials and get coupons sent directly to your email.